The usually dry Twitter CEO seemed more genuine than Facebook’s polished No.2 at a Washington hearing. Dealing with fake accounts, election meddlers and the like may hurt growth. But the industry needs a good envoy to tackle the regulatory threat. Dorsey may be the one. Twitter CEO Jack Dorsey and Facebook COO Sheryl Sandberg testify before a Senate Intelligence Committee hearing on foreign influence operations on social media platforms on Capitol Hill in Washington, U.S., September 5, 2018. 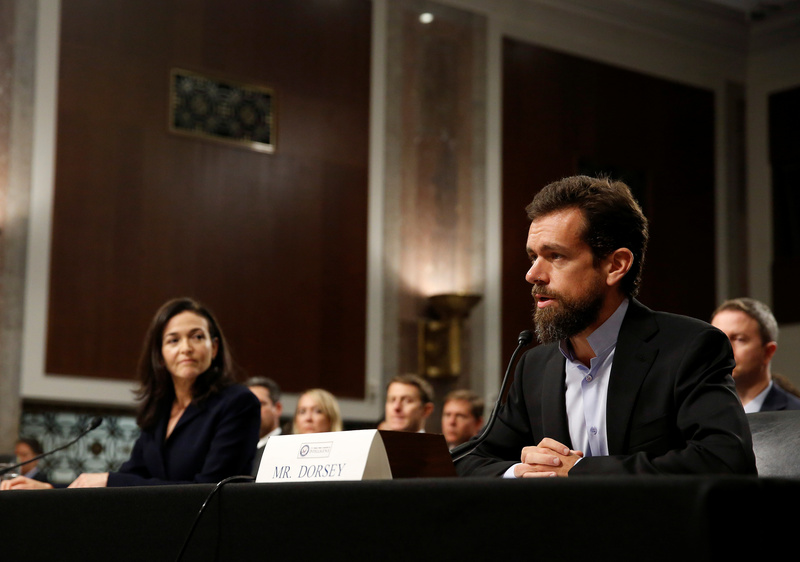 Twitter Chief Executive Jack Dorsey and Facebook Chief Operating Officer Sheryl Sandberg on Sept. 5 testified before the Senate Intelligence Committee about foreign influence in U.S. elections through the use of social-media platforms. Sandberg told senators that Facebook responded too slowly to Russian efforts to interfere in the 2016 U.S. presidential election. “We’ve removed hundreds of pages and accounts involved in coordinated inauthentic behavior - meaning they misled others about who they were and what they were doing,” Sandberg said in written testimony. The Senate Intelligence Committee also asked Larry Page, chief executive of Google parent Alphabet, to testify but he declined. The committee rejected the company’s offer to send Chief Legal Officer Kent Walker.